ESA's CryoSat-2 has delivered its first data just hours after ground controllers switched on the satellite's sophisticated radar instrument for the first time. CryoSat-2 was launched on 8 April and has been performing exceptionally well during these critical first few days in orbit. Europe's first mission dedicated to studying variations in our planet's ice cover entered polar orbit just minutes after launch last Thursday, marking the start of three days of intense activity. Mission controllers at ESOC, ESA's European Space Operations Centre, have been monitoring CryoSat-2 around the clock to ensure the satellite's systems and payload were functioning normally. The CryoSat-2 satellite was launched at 15:57 CEST (13:57 UTC), 8 April, on a Dnepr rocket provided by the International Space Company Kosmotras, from the Baikonur Cosmodrome in Kazakhstan. The signal confirming that it had separated from the launcher came 17 minutes later from the Malindi ground station in Kenya. By Sunday morning, 11 April - ESA's Flight Director Pier Paolo Emanuelli declared that the formal Launch and Early Orbit Phase (LEOP) was complete and said, "The satellite is in excellent condition and the mission operations team quickly resolved the few problems that came up. It's been a very smooth entry into orbit, precisely as planned." 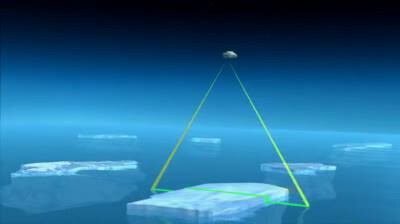 Later on Sunday, CryoSat-2's primary instrument, the Synthetic Aperture Interferometric Radar Altimeter (SIRAL), was switched on for the first time and started gathering the first radar echo data. SIRAL's first data were acquired at 16:40 CEST and were downloaded and processed at ESA's Kiruna ground station. "We switched SIRAL on and it worked beautifully from the very start. Our first data were taken over the Antarctic's Ross Ice Shelf, and clearly show the ice cover and reflections from underlying layers. These are excellent results at such an early stage and are a tribute to the hard work of the entire CryoSat community," said Prof. Duncan Wingham, CryoSat's Lead Investigator. The satellite is in a polar orbit, reaching latitudes of 88°. This orbit brings it closer to the poles than earlier Earth observation satellites, covering an additional 4.6 million sq km - an area larger than all 27 European Union member states put together. 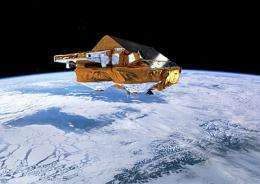 CryoSat-2's sophisticated instruments will measure changes at the margins of the vast ice sheets that lie over Greenland and Antarctica and marine ice floating in the polar oceans. By accurately measuring thickness change in both types of ice, CryoSat-2 will provide information critical to scientists' understanding of the role ice plays in the Earth system. "The combined ground teams proved the value of months of extensive training and preparation and the satellite has shown to be a high-quality machine with very few problems. The launch and orbit injection have been almost flawless and we are looking forward to an extremely productive mission," said Richard Francis, ESA's Project Manager for CryoSat-2. With LEOP complete, ground experts will now put CryoSat-2 through an exhaustive commissioning phase lasting several months, during which the systems on board the satellite and on the ground will be optimised to provide the best-ever ice thickness data from space. "We are very happy with the first calibration results from SIRAL. The data are now being processed and made available almost immediately to the commissioning teams. We are now optimising the data-processing system and results will be released once we have accumulated enough data," said Tommaso Parrinello, ESA's CryoSat mission Manager. Marking a significant achievement for ESA's Earth observation programme, CryoSat-2 is the third of its Earth Explorer satellites to be placed in orbit, all within a little over 12 months. CryoSat-2 follows on from the Gravity field and steady-state Ocean Circulation Explorer (GOCE) mission, launched in March 2009, and the Soil Moisture and Ocean Salinity (SMOS) mission, launched last November.